Hautes Alpes and Alpes de Haute Provence know together more than 250 several canyons. 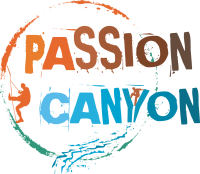 Passion Canyon has made a selection of the most beautiful canyons that this area has to offer for you. The tours listed below are a collection canyons, beschreven naar moeilijkheidsgraad en zijn volgens ons de mooiste en beste tochten die we hier samen kunnen ondernemen. 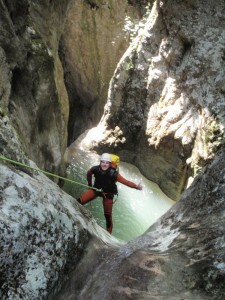 These canyons are for people who have little or no experience with this adventurous sport. The falls are not too high and the water is not too wild. This is a beginner canyon above Gap which is quite complete. We abseiling through crystal clear water to 11 meters, different slides (up to 8 meter) and some jumps to test in a stunning setting our heights. Who does not want to jump can always go down via an abseil. So everyone can find and push his own limits. This is a short family canyon next Gap, ideal for the first time to come up with this fantastic mountaineering in touch. Slides, jumps and abseils to 15 meters. All in crystal clear water surrounded by beautiful limestone cliffs. Situated in the valley next Ubaye Lac de Serre Ponçon. The water always flows freely in this canyon. We start quietly with little abseils, pass the 'cascades the Costeplane' where the water like a curtain coming down before we go to the second part of this canyon. A short slide and dive the three concatenated waterfalls to end up in the "lion's cage, an abseil 28 meter that takes us through the water in an almost underground space. Through a short via ferrata we climb out of the canyon. A classic and one of the most beautiful canyons in the Alpes Maritimes France has to offer. Packed with water, full of jumps and slides and abseils this canyon quite complete. Surrounded by steep limestone walls, this is a very spectacular canyon. An adventurous rugged canyon above the village located Réallon. 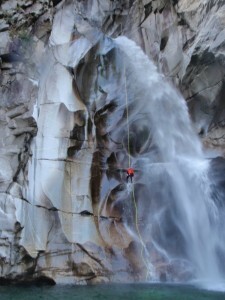 This canyon is characterized by various high abseils (tot 42m) and the fact that it is pretty remote. So we have the idea of ​​being somewhere where no man comes. We walk through a beautiful walk along the remains of a 14th century castle up the gorge where we will start our adventure. You height fear can make you a better home! This is the "little brother" of the Ravin des enfers, no less than 21 abseils tot 30 meters await us! Like Canyon de la Blache this canyon is also located at the beginning of the valley of the Ubaye, next Lac de Serre-Ponçon. Sunny and with not too much water is a good canyon to perfect your abseil techniques. This canyon in the valley of Freissinières located in the top 5 of France and a must if you are not afraid of a little water. This fantastic adventure is set high in the mountains off. After a small run of an hour we draw our neoprene suits and we literally jump into the deep end. Because the water comes into the canyon of meltwater from the glaciers, we can do this canyon until the end of summer (stop a man pas vanaf Half Augustus). Before that, there is usually too much water flows through. Jumps, slides, abseils tot 25 meter, This canyon has it all. You can also do this trip in its entirety if you are a real sportsman and several canyoning trips made. Before you can join an advanced trip we ask that you already a canyon (For example, the 'short' Chin Chin) done with us. In this way we can refine your technique and your trip so that we are well prepared to tailor our adventure go. These canyons we do in smaller groups (4 to 5 man) to ensure the safety of everyone. It usually lasts until mid-summer before we descend the canyons. August and September are the months when the prevailing conditions are good. 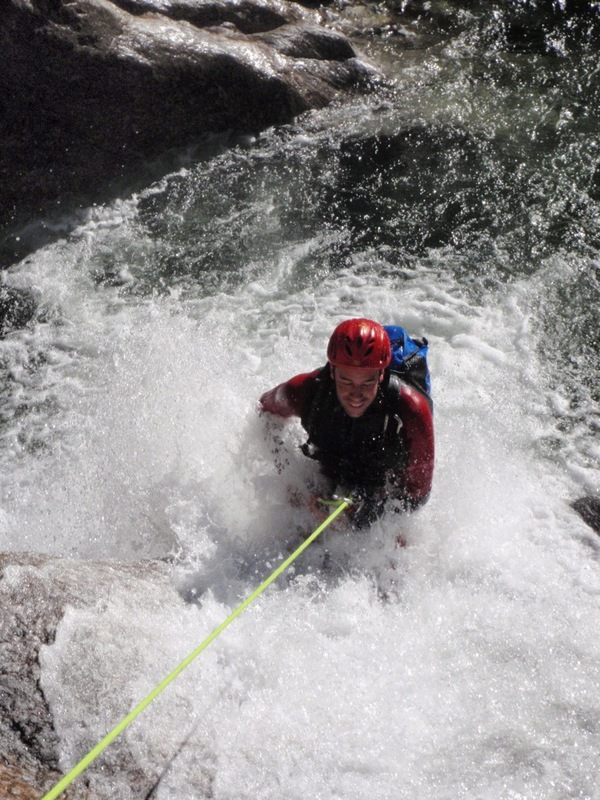 This is canyoning squared! Opposite Torrent Chin Chin in Freissinières valley spray Les Oules down. Although the abseiling not higher than 25 meters, we have to make our entire bag of tricks to get through this canyon safely. This great classic of France is extreme canyons category. 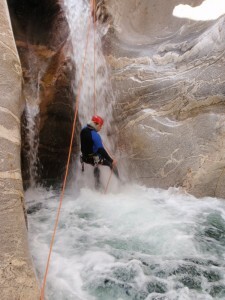 Hydrophobia here requires odious and extensive experience with canyoning you want this experience as an enjoyable trip. The "toboggan an S", "Geyser le" and "la basin des Anglais" are names that speak to the imagination of anyone who is familiar with the canyoning. A must for active canyoneur. This is the entire canyon from the stone footbridge over to the last waterfalls 43 meters below the car park at the end of the Freissinières valley. No less than 5 to 7 hour swim, slides, jumps and abseiling await us. We'll begin with a good leap in the dark under the bridge at a later carved by the water hole through the rock (syphon) swimming. Then followed a couple of small waterfalls before we get into the second part of this spectacular canyon. Due to its length and technical difficulties (reading challenges) also includes the entire canyon under extreme canyoning. Besides this range of what the lion's share in the Hautes Alpes is located, there are still many other opportunities in the PACA region, Provence Alpes Côte d'Azur. Are you looking for a guide for the canyons in the Verdon (Val Angouire, Riou or Mainmorte) or the Alpes Maritimes (Riolan, Aiglun, Bagnolar, Cramassouri, Imberguet or the Maglia) please feel free to contact us and we will make you a customized program.